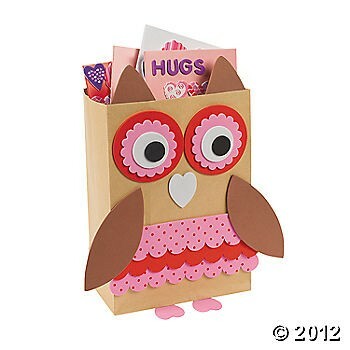 Addy needed to bring cards to school for her Valentine's Day party. 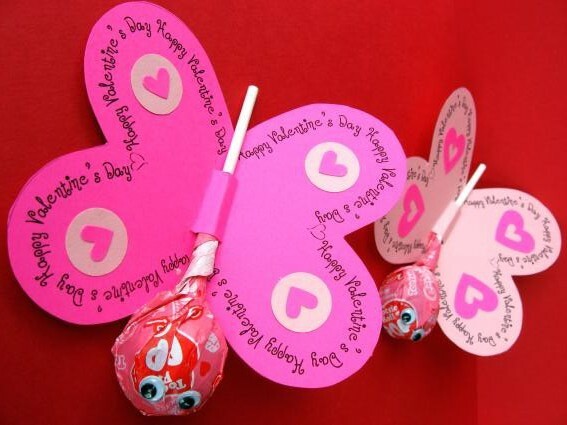 I found several cute ideas on Pinterest and these are the ones that Addy liked the best. The link has a downloadable template, but I decided not to use it. This picture was my inspiration, but I changed the butterfly up a bit. 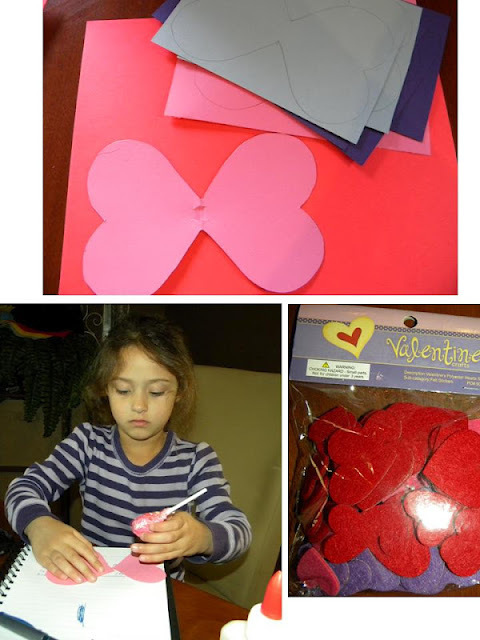 I started by making a heart shaped butterfly template. I traced it onto 20 pieces of cardstock & then cut them out. Then Addy & I took heart shaped stickers & decorated the butterfly wings. Next I printed "Happy Valentine's Day!" & "from Addy S." onto copy paper. I cut them out to look like hearts & glued them to the bottom of the butterfly wings. I hotglued googly eyes to the lollipop like the Pinterest one suggested, but I also made antennae out of white pipecleaners. And here they are! I think they turned out really cute! Addy's teacher had sent a note home that she wanted the students' Valentine's bags made out of gift bags. 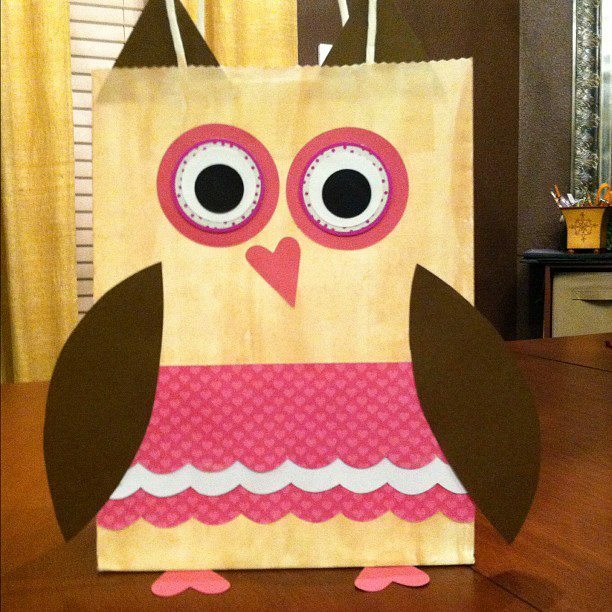 So when I saw this owl bag on Pinterest, I just had to make it for her. It's a kit that you can order from Oriental Trading, so there weren't directions on how to make it. Not a big deal though, it was really easy to make. I had bought white gift bags before I found this picture. So I painted the bag with brown watercolor paint. I used my cricut to cut the circles for the eyes, the triangles for the ears, & the hearts for the nose & the feet. Then I drew the wings & the ruffles & cut them out. And then I just hotglued it all together. I think it turned out so cute! Yes, that's right, another Pinterest find! These were one of the very first things that I pinned on Pinterest. I think they are so cute & a really clever idea. I've been wanting to make them & so I finally did for Addy's teachers for Valentine's Day. I basically followed the directions off another blog. Click here to see them. 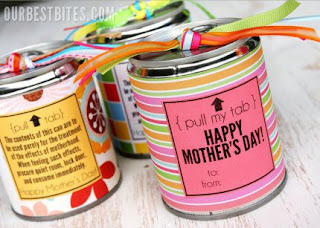 The link has downloadable labels but I made my own because I wanted Addy's teachers to know what kind of candy was in each can. Each of her teachers got 4 cans: one filled with Reese's cups, one with Hershey Kisses, one with Hershey Miniatures, & one with Hershey Nuggets. I think they turned out really cute & her teachers absolutley loved them! As you can see, I love Pinterest! I get so many great ideas off of it. If you're not already on Pinterst, you really should join. Come on over & follow me!